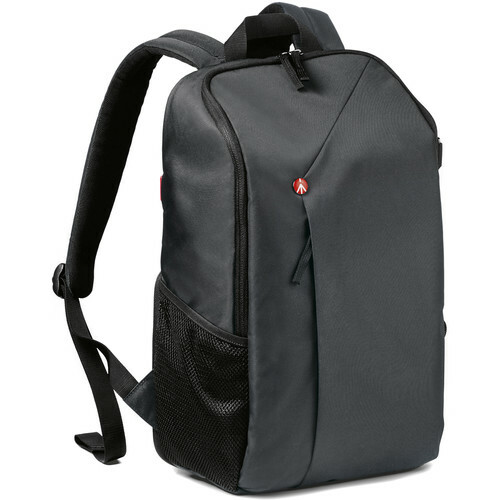 Comfortably carry your DJI Mavic Pro Drone or a small DSLR/mirrorless camera, up to four lenses, related accessories, and personal items with the gray NX CSC Camera/Drone Backpack from Manfrotto. Gear is easily accessed from the top or the back of the pack. Inside the lower, rear, zip compartment is a padded insert with flexible, touch-fastening dividers and straps for organizing equipment. The top compartment has organizational pockets and is primarily designed for personal stuff such as clothing and snacks, but can also accommodate photo-related items. In addition, there's a separate compartment for an iPad or small laptop. Photographers will appreciate the exterior accessory pockets, and dual, side, mesh pockets for storing a water bottle or the base of a compact tripod. Above the right-side pocket is an adjustable strap for securing the tripod's midsection. The pack may be carried by the top handle, worn with the padded shoulder straps, or rolled with the trolley handle strap. For added comfort, the back panel is padded to absorb shock and improve cooling. Water-repellent nylon construction helps your pack withstand the elements. Box Dimensions (LxWxH) 14.3 x 11.3 x 7.6"
NX CSC Camera/Drone Backpack (Gray) is rated 5.0 out of 5 by 1. Rated 5 out of 5 by Shu Ling Patricia from Just so practical This bag is perfect for traveling with your camera and laptop. I love the compartment divisions, so subtle but so useful. Is there a rain cover that fits optimally on this bag? Not that I know of, but its pretty water resistant as is. Ive had it out in the rain plenty of times and its protected all of my gear. Will this bag fit the Dell XPS-15 inch laptop? These are the specs for the laptop compartment:Laptop Compartment Height7.87 inLaptop Compartment Length9.84 inLaptop Compartment Width0.79 inSo if your laptop falls within that range, then it will fit. &iquest;WILL THIS BAG FIT MY EOS R WITH 24-35 SIGMA F2 AND 70-200 CANON IS II F2.8?